One bedroom apartments occupy a wide layer of the proposals on the market of secondary and primary real estate market. Between the small-sized studio apartments and quite expensive (especially in large cities), three-room or two bedroom flats – one bedroom is a more or less affordable and adequate housing in quadrature, where you can arrange all the necessary vital segments for a comfortable stay without too much trouble. But this does not mean that the planning of renovation and possible redevelopment of one-bedroom apartment would be simple and fast case. The architectural features of buildings, nuances of communication passes, lifestyle specifics of the owners, their number and personal view of a comfortable and beautiful abode – is not an exhaustive list of criteria that influence the designing of the plan for the reconstruction or repair of a two-room living quarters. 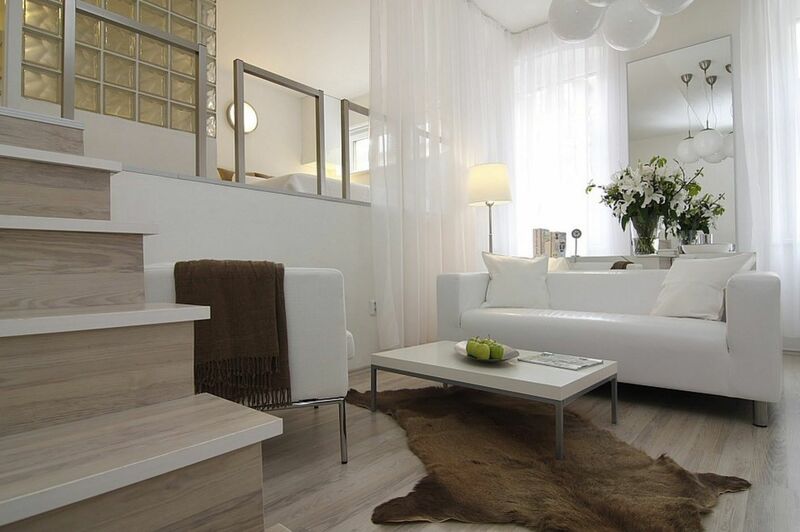 Let’s see some of the most stunning and effective one bedroom apartment design trends with photos of the modern world. chosen style of the interior style (style always lies in the basis of the draft). 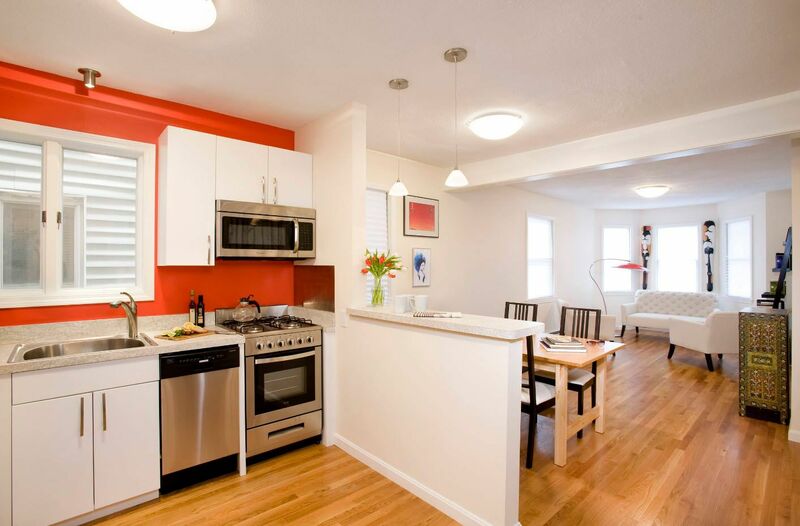 The apartments of different layouts have their own advantages and disadvantages. If we talk about the new housing market, the disadvantages of apartments located in the new buildings are very few. We can barely find an apartment with a small quadrature or low ceilings, a small kitchen area and a bathroom in the primary real estate market. Only the personal ideas of comfort and features of the distribution of functional zones for specific families or young couples can push to redevelop a new home. in some buildings of the last century construction it is almost impossible to get official permission to combine the kitchen and adjacent rooms due to the nature of the gas pipeline passing pipes (increased fire risk). Modern style is an original interpretation of “luxurious minimalism”. On the one hand, you remove all the excess out of the interior, leaving the necessary items only. But on the other, you don`t deny yourself in decorating by using quite functional design elements (lighting, mirrors, textiles and even live plants) as a decoration. We can surely affirm that all variations of the modern style are held on two pillars – personal comfort and functionality. The interior should be comfortable, practical but, at the same time, attractive. The formation of the modern style had considerable influenced by loft style motives. Spacious rooms with large windows, apparent lines of communication, extensive use of concrete and masonry surfaces, the combination of several functional segments in the same room – all of these design techniques can be found in contemporary design projects, mixed with other stylistic manifestations. It does not make sense to use a complex, multi-level finishes on one-bedroom apartment of standard size. This applies to both the ceiling and the walls. Perfectly smooth ceiling without levels is great decision for rooms with a small height. Will it be painting, wallpapering or use of tension structures – the main thing is to reach the surface uniformity with minimal loss in ceiling height. 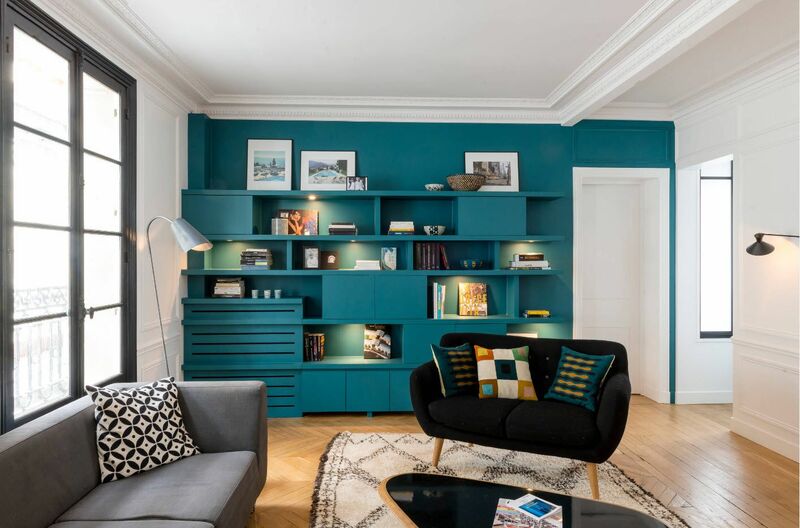 For this reason, experts do not recommend to experiment with color schemes for the decoration of the ceiling in the standard sized housing – light colors, white surface will be the key to creating a successful design. But this does not mean that you can’t use spectacular design techniques, e.g. allocation of accent wall, in small area premises. But nevertheless some caution is necessary to make out such planes. 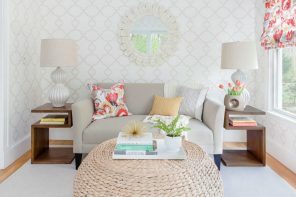 You can use textured emphasis (the same color finish, but the presence of the relief) or paste textile or metallic fabrics over a wall or part of it against plain wallpaper background. A popular way brick-wall finishing of the last season, comprising in a light tone coloring the surface while maintaining its unique texture, does not cease to be the mainstream in the current year. This design method can be used on the premises of any functional purpose – from the living room to the hallway and from the bedroom to the modest size of the corridor. If your “two-room” has high ceilings, this circumstance should be used for the sake of drawing up the original interior. 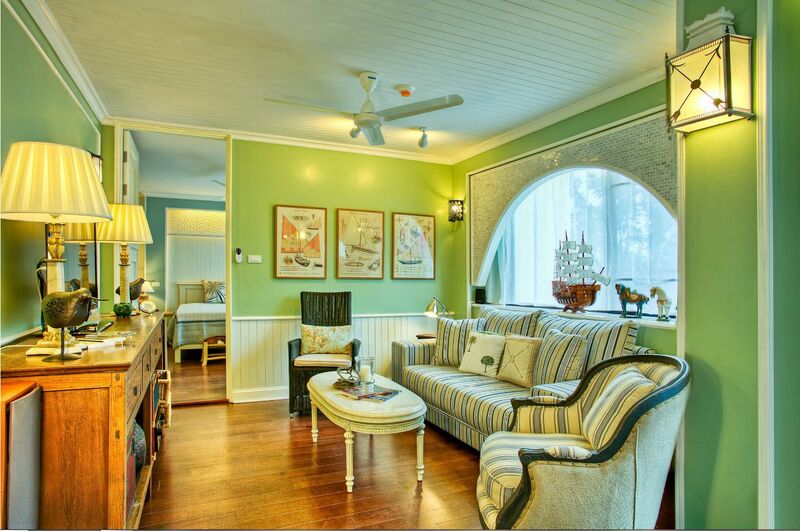 You can bring eco-design motifs in the formation and decorate the ceiling with wooden beams. If you want to arrange the room in one of the varieties of modern style – Contemporary, the splendid stucco ceiling is effectively contrasted with modern design furnishings. Within the small rooms (especially those that combine several functional areas) simplicity and conciseness in the performance of the furniture are the key for creating not only a functional and practical design, but also corresponding to the modern style. Storage systems often consist of simple modules with smooth facades, executed in neutral colors. Upholstered furniture is not less practical and at the same time comfortable. The possibility of transformation is a prerequisite for families with children or homeowners, who often have guests. For open shelves were at the peak of popularity as alternative storage spaces in the kitchen last season, so now we see these interior items only within the living room in the current period. 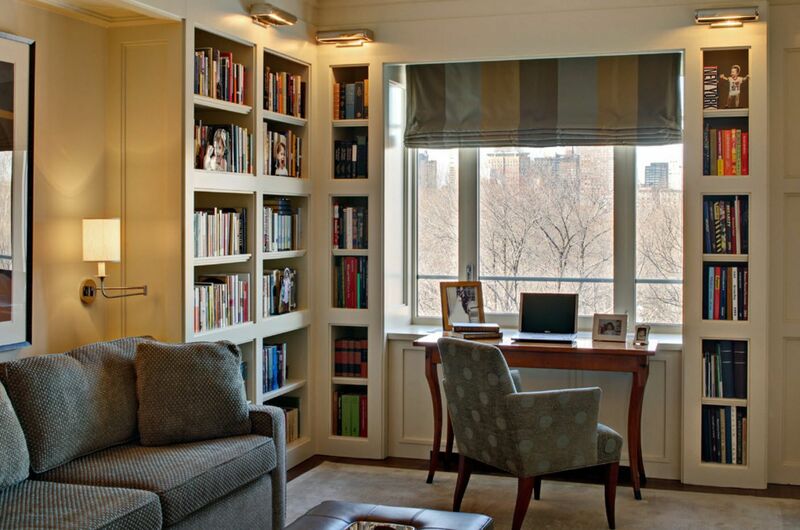 Open shelves are built into a niche, framing windows and doors; combined in book shelves, they act as room dividers. Perhaps this trend is related to the total popularization of paper books and refusing from audio versions in most cases. If your apartment has an area of around 50-60 square meters, the arrangement of all the necessary functional areas without loss of comfort is more than real. The situation is complicated only if a family has a child (or two), who should have a separate room. In this case, the living room should be combined with the parents’ bedroom. Not an easy task, but it is doable. Of course, in this case it is necessary to compromise – either owners should sacrifice their own privacy in zones for sleep and rest, or general living segment will be exclusively for family – not for the reception. How to locate sleeping area in the living room? One of the options is the use of a large (usually a corner) sofa with pull-out mechanism. During the day your room is a living room with a spacious and comfortable sofa, which can accommodate not only households, but also the guests of the apartment. And at night the sofa transforms into a place to sleep and the room is no longer a living room turned into a bedroom. But not everybody can stand the permanent sleeping on folding sofa. Even if owners are willing to sacrifice their privacy zones for sleep and rest, but only for the sake of comfort – sleeping in the big bed with orthopedic mattress. 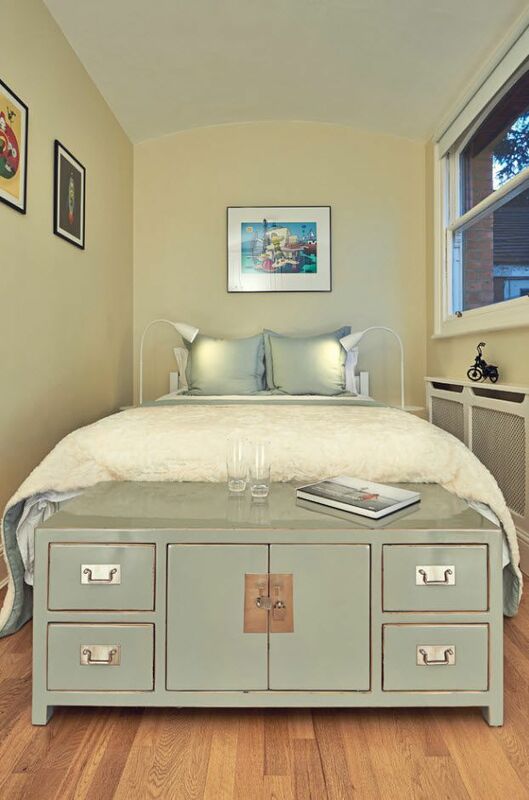 One of the bed layout options in the living room is the construction of a berth on the podium – virtually moving to the top tier. 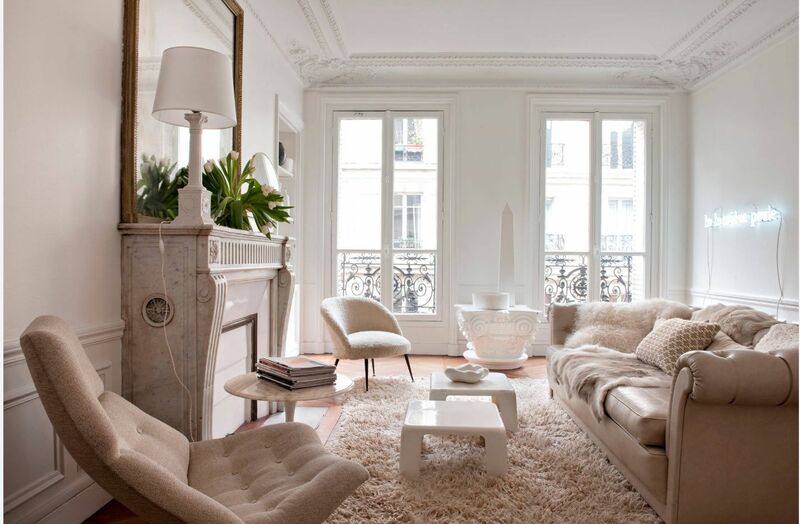 This way of planning is suitable for rooms with high ceilings. In the empty space of the podium is possible to equip the storage system, which is never enough, regardless of the apartments’ size. If it is necessary to isolate the sleeping area in the family room, you wouldn’t do without interior partitions. It is convenient to use bookshelves as the screen. They will not spoil the look of premises, but will add storage for books, documents and any other chancellery. The combining of the kitchen space with the living room (often with a corridor) allows creating a truly spacious multifunctional space in which the owners (either alone or with the help of experts) can realize their vision of a beautiful and practical design. Combined space often has a single variation of the performance of surface finishing in all functional segments (exception may appear only a kitchen splashback in the working area). Zoning of the space is hold by mean of furniture and lighting system (in some cases – with the help of carpet). A good is considered maybe the small size of the room, but its correct form, close to the square. But in the long and narrow sitting room it is possible to accommodate all required functional segments and realize this with a high level of ergonomics and aesthetics. Symmetrical layout of the furniture will help to emphasize the correct geometry in the room with an almost square shape. Centre can be a fireplace, video-zone or two installed in parallel to each other sofas (or sofa alliance with two identical chairs). In the narrow living room is better to use a sofa of corner modification – spacious, practical and “blindspot” zone in angles can be used with maximum efficiency. Usually, the smallest room is set for bedroom in apartment of ​​50-60 sq. m (up to 200 sq. feet) area. But it is large enough to distribute all the necessary furniture and create a comfortable and ergonomic place to sleep and rest. You can place not only a large bed with bedsides tables or pedestal in a room of ​​15-20 square meters, but also to build a spacious closet to accommodate clothes. This can be both linear and angular model of embedded storage systems – all depends on the layout of the sleeping room. Bedroom in modern style is a simple and functional room is not devoid of visual appeal. 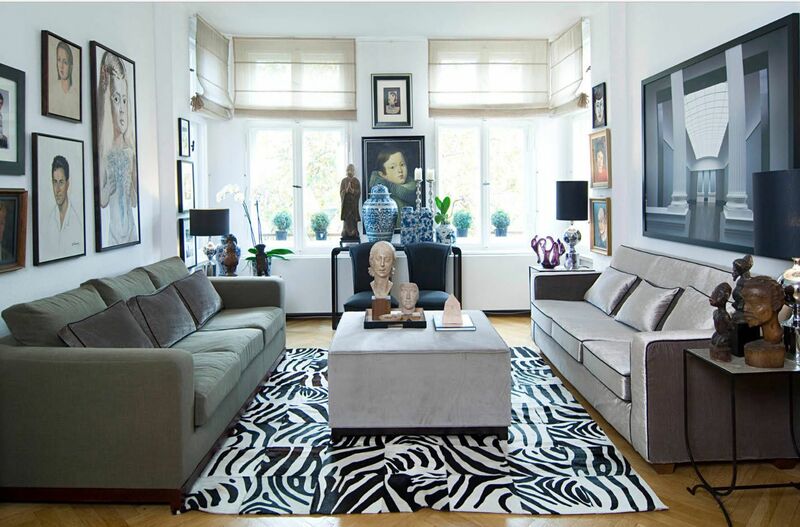 Light (mostly monochrome) wall decoration is the perfect backdrop for any furniture and decor. 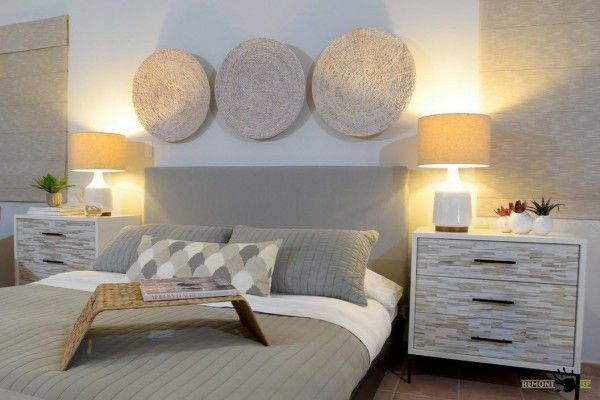 The main element of the interior, of course, is the bed and its textile design. It is the sleeper drapery can be color accent in a light and rather neutral design room. 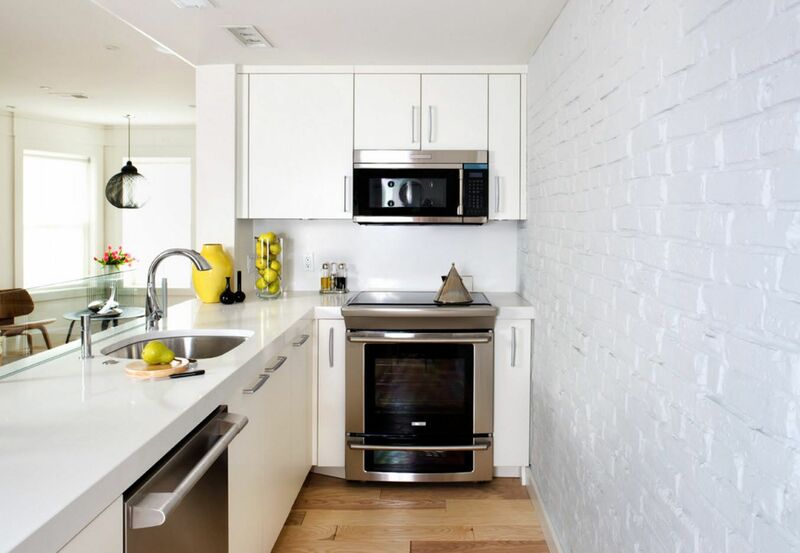 In case the kitchen space becomes a part of the adjoining room after redevelopment, it is subject to selected decorative, stylistic and color options. If the room is not spacious even after the coalescence, it is better to perform the kitchen set in neutral colors that could overlap with the color scheme of storage systems in the recreation area of living room. If the kitchen segment plays the role of color accent, the design of the living area must be done in neutral colors. If the kitchen is a separate room, there is no taboo on the choice of color palette for it (its style we consider to be common for the whole apartment). But it is important to take into account the dimensions of the space and layout of the room with respect to the cardinal. If the kitchen overlooking the south side, – you can use so popular this season cool palette, sophisticated shades of blue, for example. Either room is located in the northern part of the building, it is better to prefer warm palette – different shades of beige, brown. You can also actively use the natural wood pattern for raising the color degree of the interior. Even with the plain alternation of light and dark surfaces, you can create an original design in a small kitchen. The bathroom in the standard one-bedroom is usually small. The only exceptions are apartments with improved layout. But even in such dwelling you’ll find combined WC. Putting all the necessary areas for water and sanitation procedures in the same room helps to create a multi-functional interior, where nobody will feel shortage of usable space. Although it can’t be omitted that for large families living in two-room apartment, combined toilet and bathroom is not the best option of the distribution of utilitarian space. If it is impossible to change the shape and size of the bathroom constructively, you must use all the available arsenal of design techniques to increase the visual volume of the room. The bright color palette, mirrors and glass, glossy surface and console plumbing – all of these methods can help to create the illusion of spaciousness even in a tiny area.